Peruvian Naval Infantry training on the Amazon River. A marine is a member of a military force. Marines specialize in military actions in other countries, such as amphibious warfare. Marines usually have strong links with the country's navy. The commander in the field is usually the commander of the fleet. Support for the marines such as medical, legal, and supplies come from the navy. The anchor is often used as a symbol for the marines. The word marine is from the English word marine, meaning of the sea, from the French marin(e), of the sea which was from the Latin marinus ("maritime"). The name marine means "navy" in French, Dutch, and German. Marine forces are usually part of the navy, but they can be part of the army or act on their own. In the past the marines have protected ships at sea. When ship crews were pressed (forced to serve) the marines protected the ship from mutiny. They would also board other ships during battle or capture prize ships. They carried out raids on the shore to help the navy. 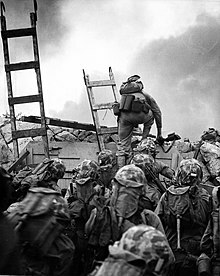 Marines would also take part in campaign ashore, to help the army. In the earliest days of naval warfare, there was little difference between sailors and soldiers on a warship. The oarsmen of Ancient Greek and Roman ships had to be able to fight the oarsmen of other ships. Armed soldiers were used on Greek ships to get on board enemy ships to fight their crews. The Roman Navy's two legions, I Adiutrix and II Adiutrix, were among the first special naval infantry units. The first organized group of marines was created when Charles V first assigned the naval infantry of the Compañías Viejas del Mar de Nápoles (Naples Sea Old Companies) to the Escuadras de Galeras del Mediterráneo (Mediterranean Galley Squadrons) in 1537. This was the start of the current Spanish Navy Marines (Infantería de Marina) corps. The American Marine Corps began on 10 November 1775 in Tun Tavern, Philadelphia, just seven months before America declared its independence on 4 July 1776. U.S. Marines training on an amphibious assault ship. The main task for marine troops is military actions near the coast. Based on ships they are trained to land on and secure key points to around 50 miles inland. Marines leave the warships using helicopters, landing craft, hovercraft and amphibious vehicles. Marines are also in other naval roles such as boarding other ships, ship clean up, naval port security, mess duty, and field day operations. The Argentine Marine Corps (Infantería de Marina de la Armada de la República Argentina or IMARA) is a part of the Argentine Navy. It has a Fleet Marine Force with one marine battalion, artillery, air defence, communications, logisticss, engineer and vehicle units. There is a Southern Marine Force with two marine battalions, a river operations battalion, a special forces unit (the Amphibious Commandos Group) and several security battalions and companies. The 5th Battalion of the Infanteria de Marina fought in the Falklands War (Spanish: Guerra de las Malvinas/Guerra del Atlántico Sur). Several of the colonies of Australia had volunteer naval infantry forces in the second half of 19th century. The Victorian Naval Brigade was formed in 1859, the Sydney Naval Brigade in 1864, the Queensland Naval Brigade in 1873 and the Naval Artillery Volunteers in 1897 (New South Wales). After the Federation of Australia they became the Commonwealth Naval Militia. When the Royal Australian Navy began in 1911 the volunteers were renamed the Royal Australian Naval Brigade. In 1915 it had 2,817 officers and men. The Naval Brigade was disbanded in 1920 and volunteers joined the Royal Australian Naval Reserve. The 2nd Battalion, Royal Australian Regiment of the Australian Army will be retrained as marines by 2014. The Bolivian Naval Force has about 2,000 naval infantry soldiers and marines. The Corps of Naval Fusiliers (Corpo de Fuzileiros Navais), with about 15,000 men, is part of the Brazilian Navy. The Marine Corps has an Operational Brigade and some Guard and Ceremonial Duty Battalions. The main unit is the brigade-sized Divisão Anfíbia (Amphibious Division). The Royal Cambodian Navy had a force of 2,000 marines in 2007. The Chilean Corps of Naval Infantry (Cuerpo de Infanteria de Marina) is a part of the Chilean Navy. They specialise in amphibious assaults and belong to the Chilean Special Forces Unit, along with the Combat Divers. The Corps has four units, organized along the Chilean territory. Each unit has its own anti-aircraft guns, artillery and landing craft. The 24,000-member Colombian Marine Corps is a single division with four brigades (one counter-terrorist and three river brigades), each with several battalions as well as small security units. It is a part of the Colombian Navy. The Croatian Navy has a 200-man naval infantry corps headquartered in Split. The group has three companies divided between Pula, Šibenik and Ploče and the 4th Guards Brigade (based at Split), which was moved to the Croatian Navy as a naval infantry unit in January 2002. The Cuban Revolutionary Navy (Marina de Guerra Revolucionaria or MGR) has a small marine battalion called the Desembarco de Granma. The 5,000-man Ecuadorian Navyhas a 1,700-man Naval Infantry Corps (Cuerpo de Infanteria de Marina) in Guayaquil. It was formed on 12 November 1962. It has two security battalions, one in the Amazon River area and the other on the Pacific coast. There is also a commando battalion based on the Galápagos Islands. The El Salvador Navy has two 600-man Marine Infantry Battalions (Batallon de Infanteria de Marina or BIM), and a 300-man Naval Commando Force. The BIMs were located at La Unión and Usulatan. The Finnish Uusimaa Brigade (Swedish: Nylands Brigad) in Ekenäs is part of the Finnish Navy and trains the Finnish Marine Commandos, known as coastal jaegers. It is the only Swedish-speaking unit in the Finnish Defence Forces. French marines in Afghanistan, 2009. Troupes de marine or "Marine Troops", are a part of the French Army. Troupes de Marine and the Foreign Legion are the only[source?] units of the French army permanently based in Africa, one regiment in Djibouti, one battalion in Senegal, one battalion in Ivory Coast (until 2009, now forming the core of Operation Unicorn), one battalion in Gabon, as well as bases in the French Overseas territories. The Troupes de Marine has infantry (Infanterie de Marine), paratroopers and light cavalry, and artillery (Artillerie de Marine). They provide the ground soldiers for French amphibious task forces and are specially trained for that purpose. The 9th Marine Brigade (9e Brigade Légère Blindée de Marine (9 BLBMa)) works with the 3 Commando Brigade of the Royal Marines, exchanging officers, sharing training and exercises. A German Navy boarding team member provides security for his team as they board a local cargo dhow by fast rope to search the vessel. The Spezialisierte Einsatzkräfte Marine (Naval Special Deployment Force) is a special operations group of the German Navy. The battalion includes the Kampfschwimmerkompanie (German commando frogmen), the Minentaucher kompanie and a boarding-company. The unit is based at Eckernförde. The Marineschutzkräfte (Naval Protection Force) protects of naval bases and facilities. The battalion is based in Eckernförde and has five units: one staff and support company, three infantry companies and a military intelligence platoon. The Greek 32nd Marine Brigade "Moravas" (32η Ταξιαρχία Πεζοναυτών Mοράβας) and the Amphibious Raider Squadrons (known as MAK) are naval infantry and maritime operations forces in the Hellenic Army and supported by the Hellenic Navy. The Honduran Navy set up one 600-man marine infantry battalion (Batallón de Infantería de Marina or BIM) in 1982. The Indian Navy has an elite special operations unit called "MARCOS" (Marine Commandos). They carry out secret activities and counter-terrorism, specializing in sea-based land warfare. Also, they provide support to Indian Army units in specialized areas, such guarding Jammu and Kashmir's Wular lake. This unit was established in 1986, and has about 2000 marines. The Indian Army also has the 340 Independent Infantry Brigade (Amphibious), part of the 12 Corps (Jodhpur, Rajasthan) of the South Western Command. 1. Two Marine Forces ("Pasukan Marinir"), a unit similar to a division, led by a Marine Brigadier General. 2. Three Marine Infantry Brigades (with nine Marine Infantry Battalions). 3. Two Marine Cavalry Regiments (with Marine Amphibious Tank and also Amphibious Artillery-bearer Landing Craft Battalions). 4. Two Marine Artillery Regiments (with Marine Rocket, Howitzer and Gun Battalions). 5. Two Marine Combat Support Regiments, with Marine Engineer, Military Police, Base Defense, Motorized Transportation, Amphibious-Reconnaissance and also Logistic Battalions. 6. Two Marine Bases in Jakarta and Surabaya. 7. Two Marine Hospitals. 8. An anti-terrorism unit called "Detasemen Jala Mangkara" (literally "Sea Ghost Detachment"). At the fall of the Shah in the Iranian Revolution of 1979, the Imperial Iranian Navy had three battalions of marines. That force has since grown to 2,600 marines in two marine brigades each of three marine battalions. These two brigades have also been reported as three marine battalions in the Islamic Republic of Iran Navy (which may be part of the Iranian Army). The Iraqi Navy is a small force with 800 sailors and six platoons of marines designed to protect the shoreline and inland waterways. The navy also protects offshore oil platforms. The navy will have coastal patrol squadrons, assault boat squadrons and a marine battalion. The force will consist of 2,000 to 2,500 sailors by 2010. The Givati Brigade is an amphibious force and is one of the infantry brigades in the Israel Defense Forces. Shayetet 13 is the elite commando unit of the Israeli Navy. It carries out special operations at sea, sea-to-land missions, maritime intelligence gathering, and counter-terrorism operations. The San Marco Regiment is a marine unit of the Italian Navy (Marina Militare). COMSUBIN (Commando Raggruppamento Subacquei ed Incursori Teseo Tesei) is the elite combat frogman force of the Navy and one of the Italian special forces. The Serenissima Regiment is the marine infantry unit of the Italian Army (Esercito Italiano). Its soldiers are called Lagunari. The NKPA's Light Infantry Training Guidance Bureau has two or more amphibious light infantry/sniper brigades. These brigades are believed deployed to Wonsan on the east coast and Namp'o and Tasa-ri on the west coast. In organization and manpower, they are reduced versions of the regular light infantry brigades with a total strength of approximately 5,000 men organized into ten battalions. Each battalion has about 400 men organized into five companies each. Some amphibious brigade personnel are trained as frogmen. The Mexican Naval Infantry (Spanish: Infantería de Marina) of the Mexican Navy consists of 20,000 marines spread in a brigade of three battalions, plus a battalion attached to the Presidential Guard Brigade, three regional battalions with headquarters in Mexico City, Acapulco and Veracruz, and thirty-five independent companies (mainly In Celaya) and detachments distributed among ports, bases and zonal headquarters. The marines are responsible for port security, protection of the ten-kilometer coastal fringe, and patrolling major waterways. The marines have light arms, heavy weapons and armored amphibious vehicles. The Navy has ceded most of its riverine responsibilities to the Army, and has reduced the size of the marine force, putting them back aboard ships where they play a vital role in drug interdiction and boarding of suspect vessels in territorial waters. The Royal Netherlands Navy naval infantry unit is the Royal Netherlands Marine Corps (Korps Mariniers), founded in 1665 as an infantry regiment to the Dutch Navy. Today, it is a brigade approximately 3500 marines strong, consisting of three marine infantry battalions (one of which is in Aruba and Curaçao), one amphibious combat support battalion and one logistical battalion. The Dutch Marine Corps is an elite light infantry unit, operating as a rapid-reaction force, deployable anywhere in the world within 48-hours notice. Dutch Marines train in all possible geological and climate conditions for their role. Enlisted marine recruit training lasts 30 weeks, and marine officers train up to five years (including naval academy time). The Coastal Ranger Command (Kystjegerkommandoen or KJK) of the Norwegian Navy is an amphibious unit trained to operate in littoral combat theatres, as naval infantry and coastal artillery. The Pakistan Marines division of the Pakistani Navy was re-established on April 14, 1990 with about 2000 men and plans to expand the force significantly by 2015. The marines are based at PNS Qasim naval base. The Pakistan Marine Corps assisted in the recovery efforts following the country's floods in 2010. The Paraguayan Marine Corps (Cuerpo de Fusileros Navales) is a battalion-sized organization consisting of four company sized brigades. The Philippine Marine Corps (PMC) has a strength of about 10,000 men divided into three brigades. The Philippine Marine Corps is considered the shock force of the armed forces and is the first unit to be involved in any amphibious or seaborne clashes. The Polish Navy maintains several naval infantry units responsible for port and coastal security. The Polish Army maintains the 7th Coastal Defense Brigade, which bears traditions of the disbanded 7th Coastal Defence Division (the Blue Berets), therefore it is sometimes referred to as the Marines of Poland. However, as of 2010 there are no plans by the Polish Army to create an active marine unit. Therefore, the 7th Brigade carries out only limited-scale exercises of amphibious assaults. Since 1621, the Portuguese Navy has maintained a naval infantry corps, which is currently known as Corpo de Fuzileiros. The Portuguese Marine Corps consists of about 1500 men, including two naval infantry battalions, a naval police unit, a special operations unit and several support units (logistical, fire support, landing craft, etc.). The 307th Marine Battalion (Batalionul 307 Infanterie Marină) is the light infantry/reconnaissance unit of the Romanian Naval Forces. It is located in Babadag, Tulcea County, and was formed in the mid 1970s for the defence of the Danube Delta and Romanian Black Sea shore. A Russian Marine on exercise. The Russian Naval Infantry, (Russian: Морская пехота) are the amphibious forces of the Russian Armed Forces. The naval infantry includes the 65th Naval Infantry Brigade of the Russian Pacific Fleet, the independent brigades of the Northern and Baltic Fleets and of the Caspian Military Flotilla, and the independent regiment of the Black Sea Fleet. The Saudi Navy maintains two 1500-man marine brigades consisting of three battalions each. The brigades are assigned to the Western Fleet headquartered in Jeddah and the Eastern Fleet headquartered in Jubail. The brigades have 200 Pegaso BMR AFVs and HMMWVs. The South African Navy's new Rapid Reaction Squadron is a marine type unit. It is planned that this squadron will eventually be a battalion sized unit. Currently it consists of roughly two companies. Members are sailors and use naval ranks. They are trained in infantry combat up to company sized operations. They are also used for crowd control and conduct peacekeeping operations. During peacekeeping operations they are meant to augment an army infantry battalion. Their role is very similar to the now disbanded South Africa Marine Corps. The Spanish Navy Marines (Infantería de Marina) are the oldest existing marine force in the world, as they were established on February 27, 1537, by Charles I when he permanently assigned the Compañías Viejas del Mar de Nápoles (Naples Old Sea Companies) to the Escuadras de Galeras del Mediterráneo (Mediterranean Galley Squadrons). Their red trouser stripes mark the Infanteria de Marina as part of the Royal Household Corps, an honor only shared with the Royal Guard, and were given by Charles III to the marines in reward for their fierce defence of the Castillo del Morro in Havana against the British fleet in 1763. Special Boat Squadron is the elite special operations unit of the Sri Lanka Navy. It is capable of carrying out amphibious raids/operations, maritime counter-terrorism, reconnaissance and target indication, combat swimmer missions and small boat operations. As a special forces unit, its role is not limited to water-borne operations. It also conducts operations on land, either with ground combat units of the Navy and the Army, or separately. Naval Patrolmen are naval infantry units of the Sri Lanka Navy. It may be 2-3 battalions strong. These units were formed primary as a protective force for base and port security, but has since been trained and deployed for amphibious and land combat operations. In addition to having light arms, the patrolmen have 60mm, 82mm mortars and operate Unibuffel light armored vehicles. The Swedish Amphibious Corps (Svenska amfibiekåren) is an arm of the Swedish Navy. The Corps consists of six battalions, capable reconnaissance, amphibious assaults and combat on, over and under the surface of the sea. The Amphibious Marines Brigade (Amfibi Deniz Piyade Tugayı) of the Turkish Navy consists of 6,000 men based in Foça near İzmir, three amphibious battalions, an MBT battalion, an artillery battalion, a support battalion and other company-sized units. The Su Altı Taarruz (SAT) of the Turkish Navy is a special operations force for underwater attack. The missions include the acquisition of military intelligence, amphibious assault, counter-terrorism and VIP protection. The Su Altı Savunma (SAS) of the Turkish Navy is a special operations force for underwater defense. A Ukrainian Marine displaying an AKS-74U. The Ukrainian Marines was founded in 1993 from a unit of the former Soviet Naval Infantry. The UAE Marines is a battalion-sized unit; it has BTR-3s. The Royal Marines (RM) were formed in 1664 and are a part of the UK Naval Service. They have the longest infantry training in the world, which stands at 32 weeks for an enlisted recruit and 64 weeks for an officer recruit. They include a commando brigade (3 Commando Brigade RM), a naval security unit responsible for guarding Britain's naval nuclear weapons and other security duties (the Fleet Protection Group RM), a landing craft and boat-training group which is also a parent unit for three landing craft units deployed on amphibious-support ships, a naval special forces unit (the Special Boat Service) and a naval band service (Royal Marines Band Service). The United States Marine Corps (USMC) is currently the largest marine force in the world, responsible for much of the United States expeditionary operations. Created in 1775, they were originally intended only to guard naval vessels during the American Revolutionary War. While the USMC is a component part of the Department of the Navy in the military command structure, it is a military branch separate from the United States Navy. The USMC also provides Marines as security guards at U.S. diplomatic posts throughout the world. They also provide helicopter transportation for the President of the United States aboard Marine 1. Their motto is Semper Fidelis, "always faithful". And mascot Chesty the Bulldog after receiving another title from the Germans after the battle of Belleau Wood "Teufel Hunden" meaning Devil Dog. The Confederate States Marine Corps (CSMC), a branch of the Confederate States Navy, was established by the Confederate Congress on 16 March 1861. Late 19th century French Marines (officer and private). German Empire: During the German Imperial era, three ‘sea battalions’ or Seebatallione based at Kiel, Wilhelmshaven and Tsingtao were maintained. These units served intermittently as colonial intervention forces. The III Seebatallion at the imperial navy’s east Asian station at Tsingtao was the only all-German unit with permanent status in a protectorate/colony. The battalion fought at the Siege of Tsingtao. The old Iraqi Navy maintained several marine companies. The Iraqi Republican Guard maintained a Marine Brigade as part of its 8th As Saiqa Special Forces Division. The brigade had Brazilian made Engesa EE-11 Urutu wheeled armored personnel carriers. The landing of the Japanese Marines from the Unyo at Ganghwa Island, Korea, in the 1875 Ganghwa Island incident. Both the Imperial Japanese Navy and Imperial Japanese Army maintained marine-type units. Both were dissolved at the end of World War II and Japan no longer has marines. The Imperial Japanese Navy's Land Forces maintained several combat units. The Lebanese Forces militia maintained a small elite marine unit until the LF was disarmed and disbanded the unit. The Marines were the navy of the militia and it maintained a force of small boats. The battle honors on the Korps Mariniers' colors are: Raid on the Medway (1667), Kijkduin (1673), Sennefe (1674), Spain, Dogger Bank (1781), West Indies, Algiers (1816), Atjeh, Bali, Rotterdam (1940), Java Sea (1942), Java and Madoera (1947–1948), and New Guinea (1962). Portugal raised numerous companies of Special Marines (Fuzileiros Especiais) and African Special Marines (Fuzileiros Especiais Africanos), both at home and in the African colonies of Guinea-Bissau, Angola and Mozambique, for service in Africa during the Portuguese Colonial Wars. The African Special Marines were all-black units. The Ushkuiniks were medieval Novgorodian pirates who led a Viking-like life and often raided other Russian settlements. The Soviet Navy had a number of small battalion-sized naval infantry and coastal defence units that mostly served in the ports and bases before the Second World War. During the war, and building on the visuals of the mutinied sailors of Petrograd in 1917, the Stavka ordered formation of naval infantry brigades from the surplus to either ship or shore duty sailors, and forty brigades served in mostly ground troops roles until 1944 when they were used for amphibious operations in Norway and along the Black Sea coast. The Royal Marines date from the establishment of a Maritime Regiment of Foot in 1664. Six regiments of Marine Regiments for Sea were formed in 1702 but by 1713 they had been disbanded or taken into the army as regiments of foot. In 1755, a permanent Corps of fifty companies of marines was established for direct service under the Admiralty and this force has an unbroken descent to the Royal Marines of today. See History of the Royal Marines. The Corps of Colonial Marines were raised from former slaves as auxiliary units of the Royal Marines for service in the Americas: Two of these units were raised and subsequently disbanded. The first was a small unit which existed from 1808 to 12 October 1810, the second was more substantial and existed from May 1814 to 20 August 1816. Nobel Jones' Company of Marine Boatmen of the Georgia militia also fought in the War of Jenkins' Ear, helping defeat a Spanish amphibious landing on St. Simons Island in the Battle of Gully Hole Creek and the Battle of Bloody Marsh. The Continental Marines were the marine force of the American Colonies during American Revolutionary War. The Corps was formed by the Continental Congress on November 10, 1775 and was disbanded in 1783. The Continental Marines' first and only Commandant was Captain Samuel Nicholas. The 12th Naval Infantry Brigade (Mornaricka Pesadijska Brigada) of the Yugoslavian Navy consisted of 900 to 2,000 men in three battalions. A multi-ethnic unit, the brigade was broken up during the dissolution of the Yugoslav federation and saw little action. ↑ Casson, Lionel (1991). The Ancient Mariners (2nd ed.). Princeton University Press. ISBN 0-691-01477-9. ↑ Lendering, Jona. "Legio I Adiutrix". Livius.org. Retrieved 7 February 2010. ↑ Lendering, Jona. "Legio II Adiutrix". Livius.org. Retrieved 7 February 2010. ↑ "Specialist force trained for East Timor-style operations". Herald Sun. 12 December 2012. ↑ "Special Forces (Maritime) (Croatia)". Jane’s Amphibious and Special Forces. 9 December 2011. Retrieved 31 March 2012. ↑ The IISS estimates the IRGC Naval Forces are 20,000 strong including 5,000 marines (one brigade). ↑ "Royal Marines Recruit Training". Secretary of State for Defence. Retrieved 14 November 2008. ↑ "Royal Marines Officer Training". Secretary of State for Defence. Retrieved 14 November 2008. ↑ United States Department of the Navy. "Expeditionary Operations" (PDF). United States Government. p. 35. Retrieved 14 November 2008. ↑ "Birth of Marines". Recruit Knowledge. MCRD Museum Historical Society. Archived from the original on 2006-05-23. Retrieved 2006-02-03. Wikimedia Commons has media related to Amphibious forces.